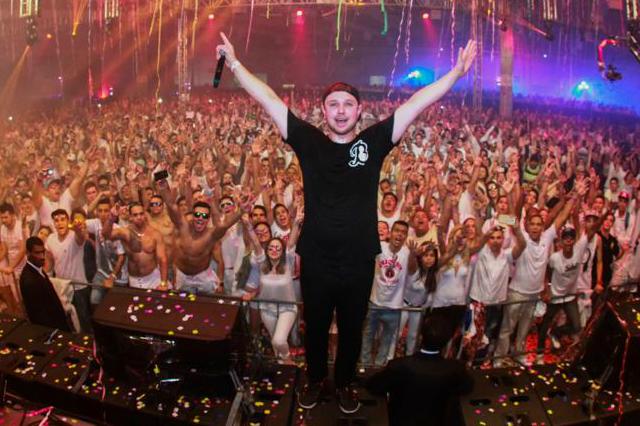 Los Angeles-based DJ Borgeous may have left some scratching their heads when it was announced that he was one of the top four artists at this year’s 13Fest. Who is Borgeous? And how the hell do you even pronounce that? While the name may not ring a bell to listeners outside of the EDM world, even casual partygoers and bar hoppers have surely heard one of his signature tracks. Borgeous, along with friend and producer duo DVBBS, created “Tsunami” in 2013, and the electronic industry were blown away as if an actual tidal wive hit their studios. “Tsunami” is a house song with a perfectly intriguing build up that eventually pays off with a crazy intense drop. It’s a track that is regularly remixed and played by DJs worldwide. Borgeous and DVBBs also worked with Dmitri Vegas and Like Mike on “Stampede,” another EDM hit in 2013. Fast-paced synth and a constant thundering drum pattern make it a perfect song for pumping up a crowd. “Tsunami” and “Stampede” shot Borgeous to international fame, but he continues to churn out popular songs. His most recent release, “They Don’t Know Us,” is a house track that doubles as a love song, with an emotional female lead and upbeat melody. Borgeous even collaborated with two rappers familiar to Athens in Waka Flocka Flame and Wiz Khalifa. “Toast” is a rapid-fire EDM song that involves a weed rapper and a wild-the-f**k rapper that is so strange that it works. Other Borgeous songs to check out are “Breathe” and “Celebration,” which are both party anthems likely to be heard during his 13Fest set. He may not be a household name yet, but Borgeous will definitely make his presence known in front of thousands of partygoers at this year’s #Fest.